Today's studio comes from Serbia. 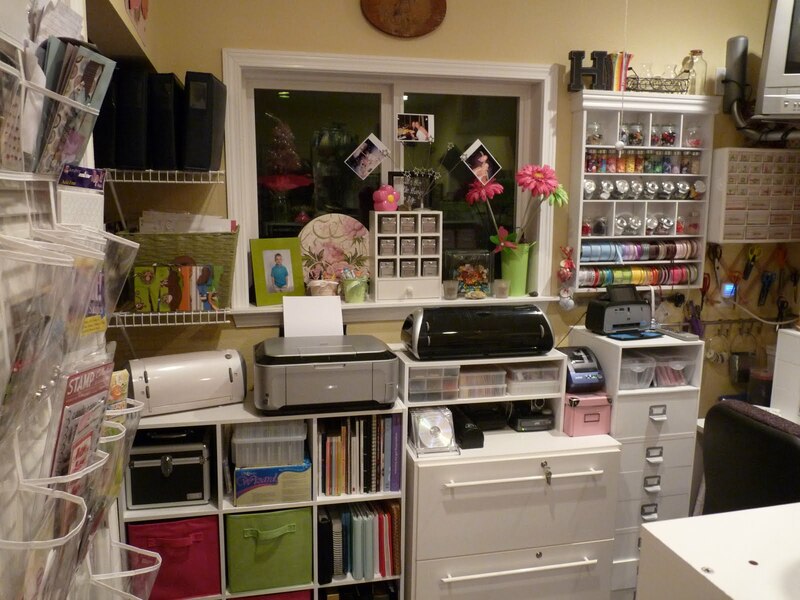 My craft room is 6ft x 9ft approx. 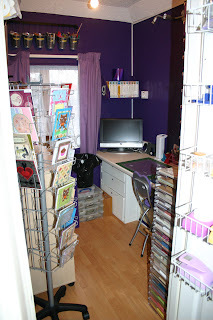 This is place that I can create, draw, knit and sew in. I especially love my shelfs with yarn and knitting books and magazines because I like having things within reach.Yellow is my favorite color and this room is full of light and is so inspired for me. Click here for more info on Ree's idea. 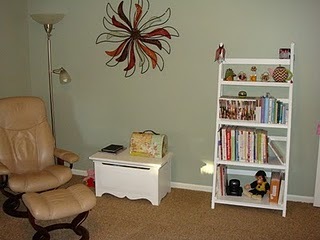 Today we feature Jan's room. 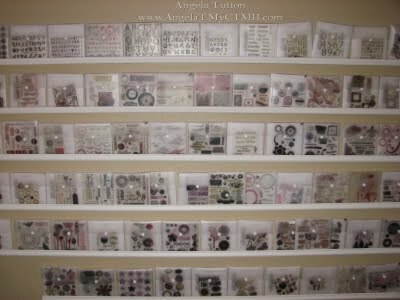 It is pack full of lovely stuff and all is quite well organized. I strongly recommend to check her blog post for a lot more photos! Click here for more photos. 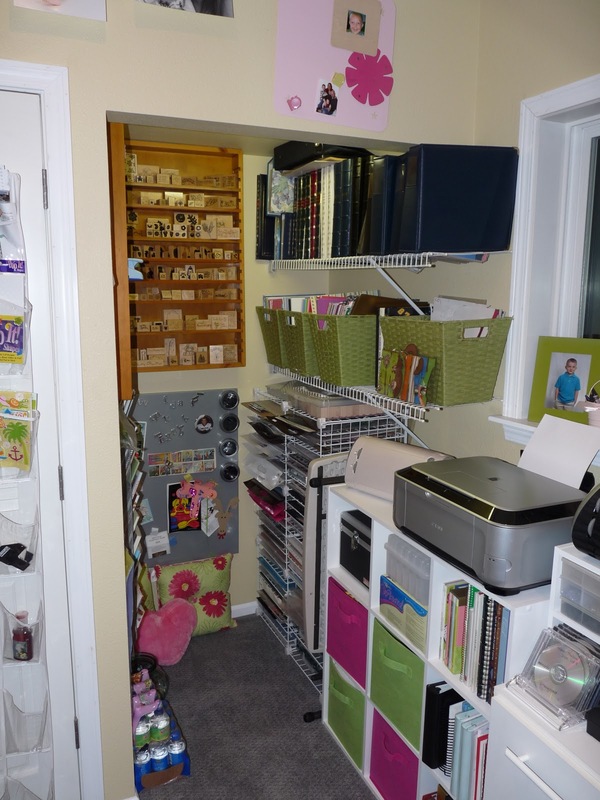 Heather's room is full of craft tools and goodies. This is what Heather says about her room. 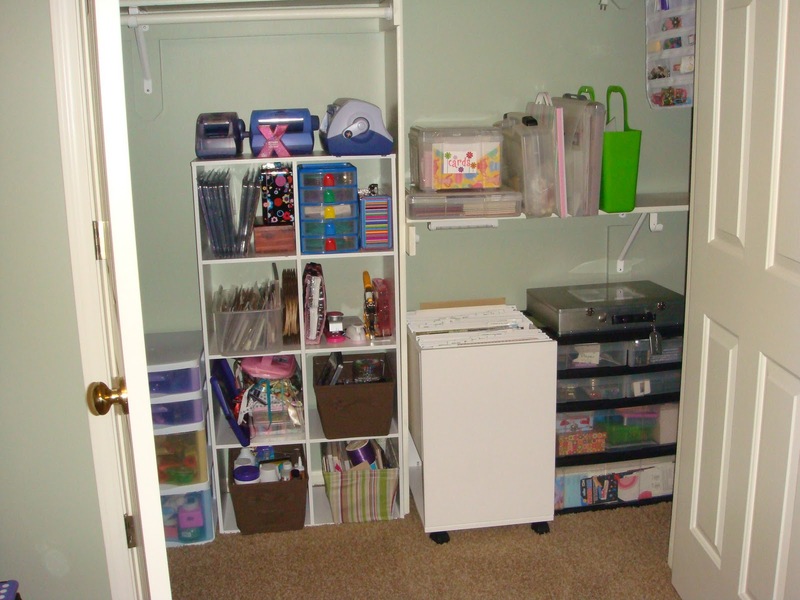 My room is 5 ft x 9 ft with a 2 ft x 3 ft Cutout "Closet" area. I have a 4ft Pony Wall that seperates my husbands side of the office with the same dimensions. 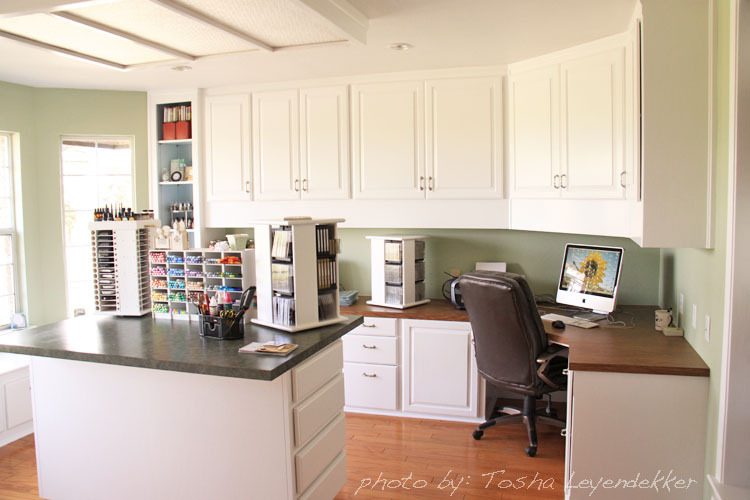 We converted 1/2 of our garage to make this space, and had our contractor put in the window. He built doors around our Furnace and Hot Water Tank. 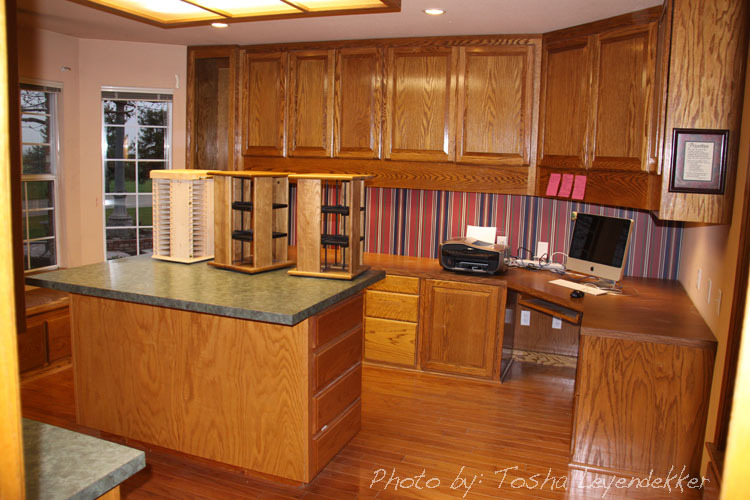 Click here for a lot more photos! 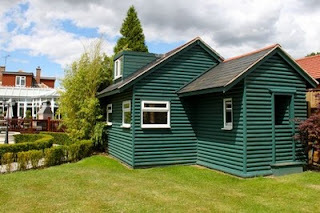 Same units, just a nice coat of paint over the units and the walls. Some people like Marlene are lucky! And this is a video tour. Click here for her post. It is worth it, if you are not the jealous sort. 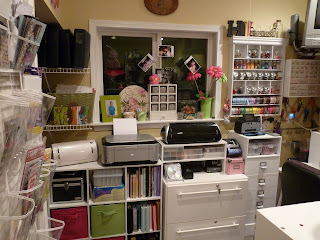 Georgina's craft room is 10' x 8' which is perfect for her needs as "creates her little safe heaven"! 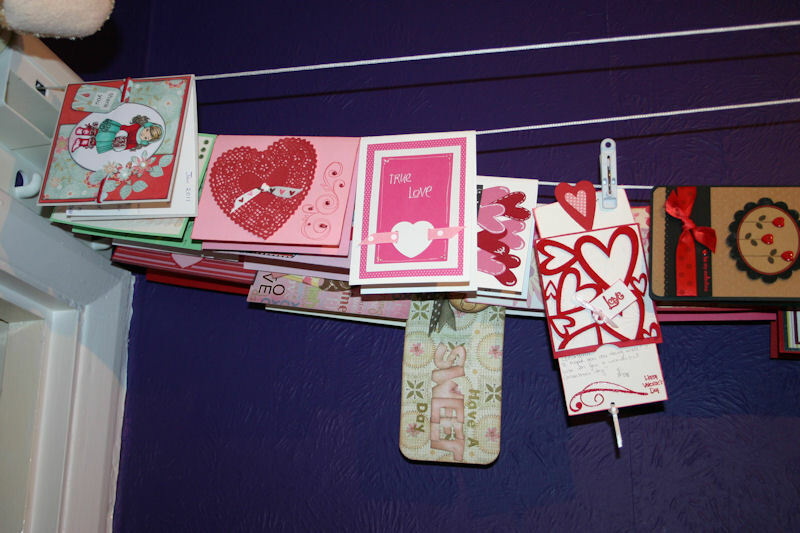 The idea that I love form this studio is how she displays cards. Isn't it great? It is a 4 lined retractable washing line across the top of the room, where she hangs all her cards on it. 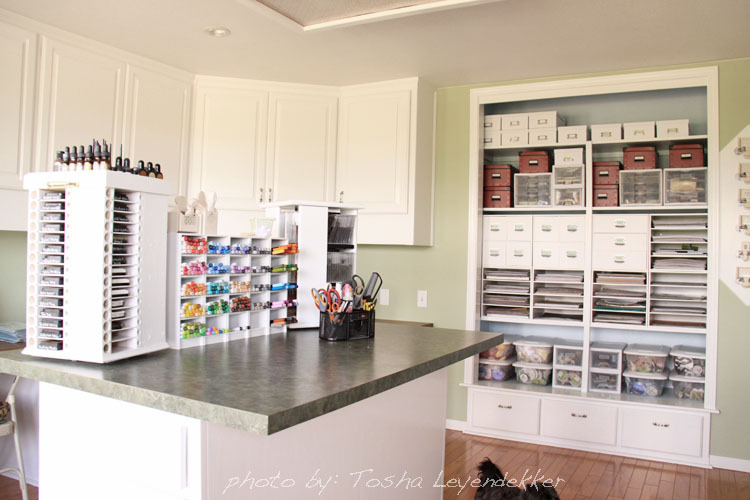 Click here for more photos and explanation from Georgina on what and why she uses for Crafty Storage. Amanda's room is 10' x 12'. Love how decorated this room is. Click here for a lot more photos. Saron uses an acrylic desk pot with partitions from Muji, the great japanese store with shops in Europe, USA, Japan and, of course, available online. A similar option is what I have been using for a while, although mine is a bit wider so it has some restrictions, check it here. 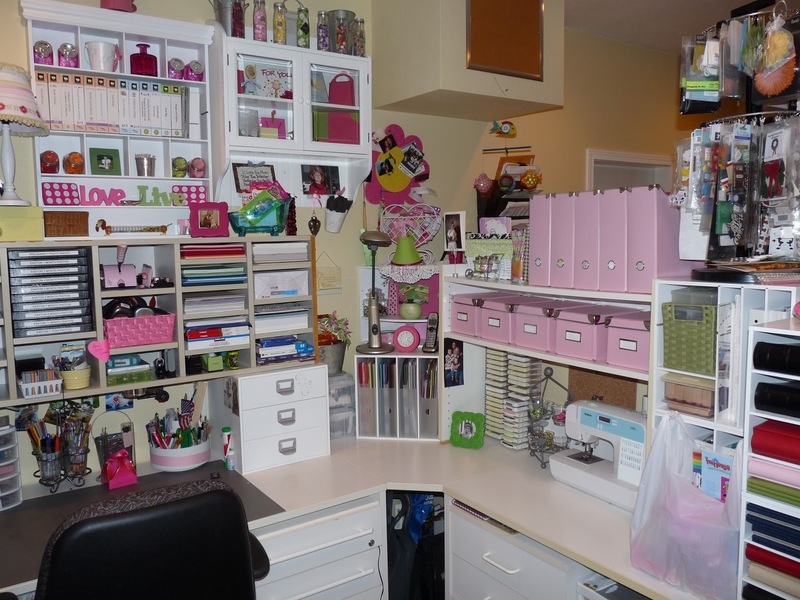 Although Patty says that this is her play room rather than her studio. Well, to me it does not make a difference, this is the room where she creates and by the looks of it also relaxes. 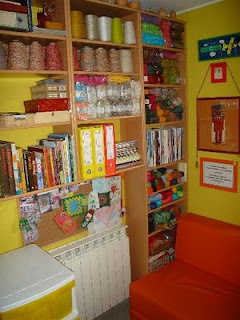 Crafting is for many of us a hobby and the main aim of a hobby should be to enjoy, relax and play. And I think this is a room that offers just that. Even though I don’t do a whole lot of designing, I do love to make all my cards and have enough supplies to make them for life!! I needed to recycle things I already owned when I was able to move my craft room in to my daughter’s old room (redecorated for me! ), and I wanted most everything to be in the closet. I picked up a few inexpensive items – the hanging jewelry organizers, the cube units, and my big splurge was a cart made especially for housing 12 x 12 papers. 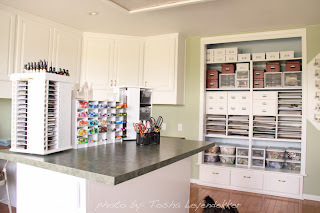 I have most of my fun organizing and reorganizing the stuff, and I love to try to let the supplies show through in the containers I do have out, letting their fun colors be part of the décor. The room is 14' x 14'. 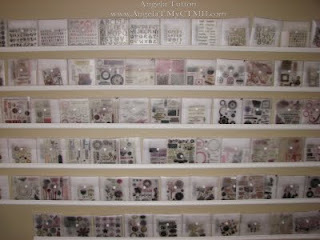 Click here for a lot more photos and explanation from Patty on what and why she stores crafty stuff. Love the minimalist approach. Just looking at those pictures I feel kind of free to create. 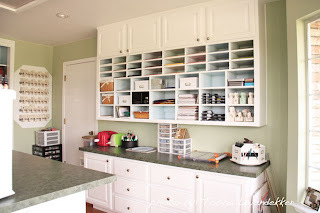 Sometimes clutter -even the most scrumptious crafty clutter- does not help creativity. That is why I think this room is so great. 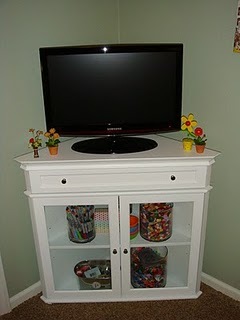 Almost everything Vavie used is from IKEA -you have got to love Ikea! The room is about 10' x 13'. Click here for more photos and ideas from Vavie. The write up is in french! As a big cat lover, I could not resist posting this photo below! 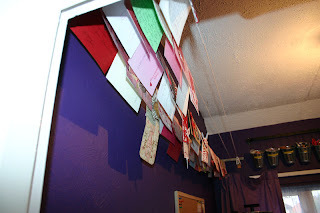 Kimberly's room is 10' x 10' and was formerly a bedroom. 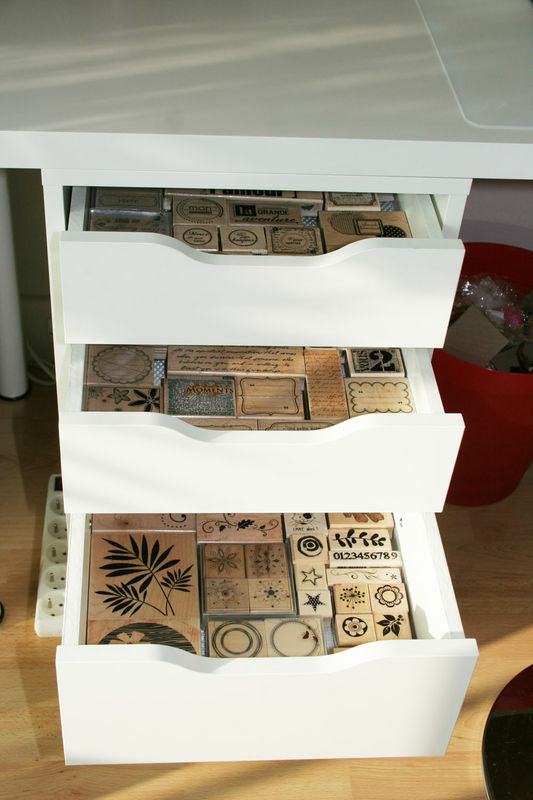 I love this idea on marker pen storage. 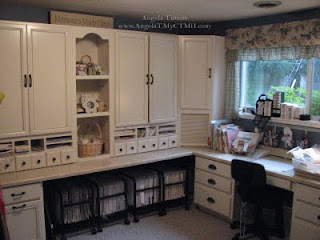 Click here for a lot more photos and explanation on what and why Kimberly uses for storage. This is the area where she keeps her most important tools that she uses most of the time which consists of inkpads, markers, adhesives, embossing powders, distressing tools and scissors. 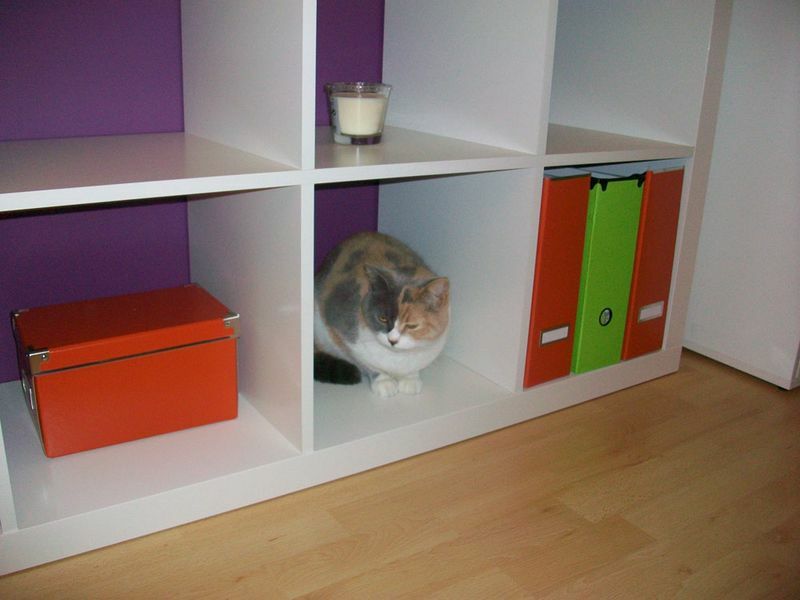 On the lower shelves - she has her acrylix blocks, foam tools, spritzers, distressing sprays and reinkers.